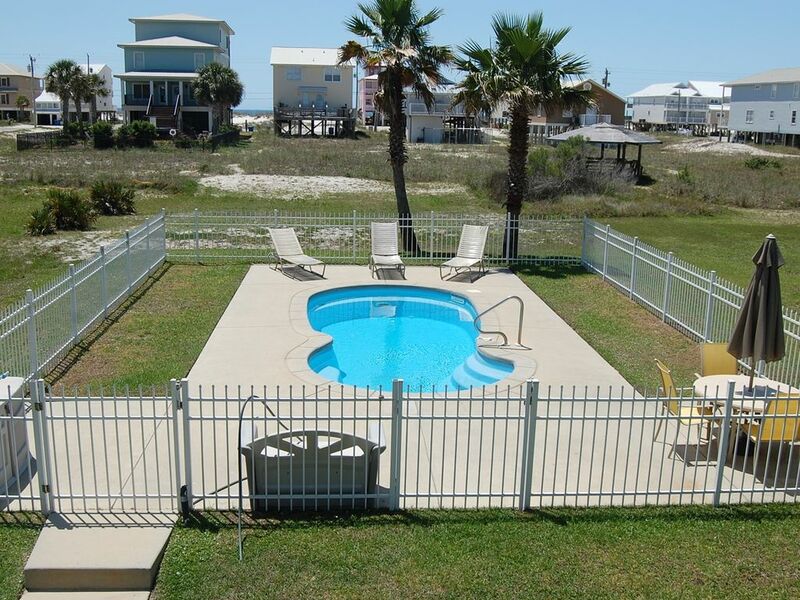 Relax in this Gulf Shores home with private pool, located on West Lagoon Ave. This home offers so many amenities. Lovely 3 bedroom house with a partial view of the Gulf or The Lagoon from 3 balconies, near public beach access, 4 TV's, VCR/DVD player, DSL, BBQ Grill and your very own salt water pool. The second floor of this beautiful home is where you will find the second bedroom which has a queen size bed, and the third bedroom that has two twin beds, both sharing the common bathroom in the hall. Down stairs on the main level is the Master Suite, with a king size bed, dressing area, bath with a garden tub & separate shower. There is a fully equipped kitchen with new stainless steel appliances. The dining area has a table that seats 6, and two additional bar stools at the kitchen counter for added dining. The spacious living room has a sleeper sofa for added sleeping accommodations, as well as 4 chairs, and a beautiful armoire with a TV for your enjoyment. Below this home is ample space for parking your vehicles and just a few steps away from a play area for the little ones, with a sand box. A small walkway that leads to your private fenced in salt water pool, with spacious deck area for sunning, relaxing, and entertaining. Listen to the waves breaking on the snowy white beach while sitting on the large balcony in the evening. This home is truly your home away from home in all aspects.Your walking beach access is across from 12th street. There are public beaches that you can drive to and park. FREE WIFI. This is a non-smoking, no pet home. NO PETS! This property is a Saturday - Saturday rental only during peak season. Minimum age of a person renting a unit is 25 for single person and 21 for married couples. PLEASE CALL TO BOOK WINTER RENTALS! Monthly reservations made online will not be confirmed until a reservationist reviews the booking details and verifies that the pricing is correct. If there is an error you will be contacted! Also, in order to avoid same day booking we do not allow reservations to be made online if booking within 48 hours of arrival. Several of our rental properties do have a nightly minimum requirement. Take a biplane ride: See Gulf Shores and Orange Beach from a bird’s eye view at Bird of Paradise, located at the Jack Edwards Airport in Gulf Shores, AL. This historic biplane is made for two passengers and gives you a view of our beautiful beaches that is a must see. Enjoy Gulf Shores sports facilities: If you are looking to have fun and stay in shape on vacation, Gulf Shores is home to a top of the line sports facilities, paths for jogging and trails for sunset bike riding. Add to your beach stay by treating yourself to a day at the spa. There are many spas in Gulf Shores or Orange Beach that offer massage therapy, facials, pedicures and more. My husband was raised in Gulf Shores. I have lived in Baldwin County most of my life. We have 5 maried children and 13 grandchildren. We own a property management company in Gulf Shores. We enjoy outdoor activities and working in the yard. We purchased this property as and investment but have come to love the peace and tranquility of this property. We enjoy listening to the gulf waves after dark and watching the birds during the day. The benefits of staying in a private home are numerous. This property is a short walk to the beach or there is a public access at the end of the street that you can drive to and park right across the street from the public beach access. New pool has been installed. Our grandchildren are really looking forward to this. View more about Anchor Vacations, Inc.
Nice quiet neighborhood close to all the attractions. This is the second year in a row we have stayed at this place and look forward to returning again. Cory, We are really pleased that your family has enjoyed their stay at Beach Time. We appreciate all of our guests but especially our repeat guests! See you next year! This was our second time staying at Beach Time as it's become one of our favorite vacation spots! It has everything we need for a perfect vacation. We WILL be back again! And Anchor Vacations has always been awesome! Thanks so much. We look forward to your next stay at Beach Time! The house was very clean with plenty of room. The location is great for walking/running as the street runs parallel of the lagoon and just one street over from the high traffic beach boulevard. Early mornings spent on the front deck with a view of the lagoon and afternoon breaks or a meal on the back deck with a view of your own pool is quite nice. The kitchen had all we needed but I would recommend a replacement of the large skillet. It would've been nice to have had the option for lighting directed at the pool. The area is quiet and great for star gazing. Management was friendly and helpful. We would recommend this property and would stay again. We are so happy that you enjoyed your stay at Beach Time! We will be sure to get another large skillet in the unit and we hope you to see you again! The pool has a light that lights up the area around the pool. My vacation rental(Beach time) was great. It was just as described on website, the private pool was the highlight and most enjoyable moment. We enjoyed the peace and quiet during the day and especially at night. We are happy that you and your family enjoyed your stay at Beach Time! Please give us a call when you start thinking about your next visit to our beautiful beaches! Great Vacation! First time my family has been to Gulf Shores in almost 15 years. House is in a great location, close to nearby shops and restaurants. 5 minute walk to the beach. Very clean. Would return in a heartbeat! We are so pleased that you enjoyed your stay at Beachtime. Call us when your ready to plan your net getaway to the beach!